I am somewhat in shock to realize that I am now a mother to a ten year old. Double digits, sidling up to the teen years, and the much-too-soon-to-follow adulthood – for me, yet another glimpse of how time flies. I’m not sure if it surprises me more to see how grown up and mature my ‘baby boy’ has become, or to wonder at how it is possible that I am old enough to be his mom. The truth is, I doubt I will ever get over this age/time connundrum, and have asked enough parents in my practice, who have grown kids – to believe that this feeling of the surreal passage of time will continue to stay with me. And so my only saving grace is to embrace these days – my modus opperendi as a mom who would sometimes like to freeze-frame time. I want to enjoy the moments as they come, make great memories, and do my best to be as fully-engaged in their lives and in the big and small moments as possible. I think with a memory bank brimming with great memories, I will have more substance to recall these days. I am certain that one day they will feel that they, too, passed so long ago. My other saving grace is being aware of how poignantly clear many of my own best childhood memories still are for me, decades later. 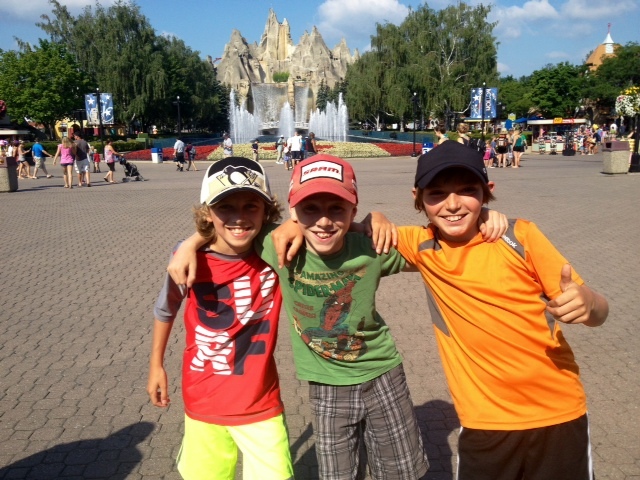 Comments were made of how ‘brave’ I was to take three (almost) ten-year-old boys to Wonderland. 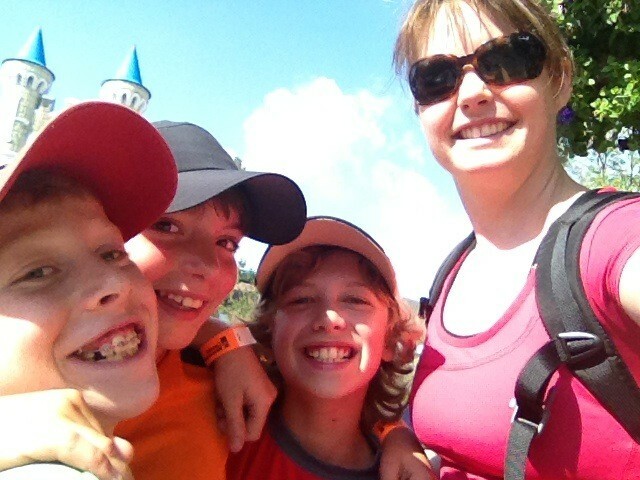 Me and three full-of-life boys, 16 roller coasters, and a waterpark. Could I handle it? (them)? To be honest, it never occurred to me that it could be anything other than fun. But FUN is far too small of a word to sum up our ‘play-full-out’ day together. From the drive down, music blasting, and the car fairly shaking with their dance moves and laughter, to the only slightly-subdued return drive 11 hours later – I’m not sure if I can find a word that could encompass what a fantastic day it was. I believe Mother Nature was on our side with a heat wave that kept line ups to an almost non-existent size (unheard of! – as I know many coasters usually host hour-long lines for a 60-second ride). With 5-10 minutes between exhilarating episodes of amusement park fun, we ran from attraction to attraction. From thrilling roller coasters to cooling off in the waterpark with its waterslides and wave pool, our day went from one fun moment to the next. And although I started the day by diplomatically explaining – almost apologetically – that they would have to take turns sitting with me on any of the two-seater rides – by part way through the day, even that line seemed to blur. “Mom! I’ll ride with you this time!” was music to my ears. Somehow I seamlessly blended in to the fun – perhaps because I was enjoying myself every bit as much as they were. Upon being referred to by park staff as “Big Sis”, I chose to believe the reference was less blatant flattery (I’m not in denial about that fact that I look old enough to be one of their moms) – but that their complete and joyful inclusion of me in their crazy antics appeared to be that reserved for friends moreso than for moms. While I may wear my ‘mom badge’ with the utmost pride, in this context, I have no problem playing the role of playful Big Sis. Even with a turn in Mother Nature’s mood – with the rides shut down for an hour with looming clouds and distant thunder – apparently our mad dash for the shelter of the restaurant made the day ‘even better’. But as the crowds thinned out to a ghost-town population, we decided to extend our stay even longer. How could we pass up the opportunity to ride any coaster of our choosing repeated times without even getting off? Again, unheard of!? I think so. I think our motto for the day could certainly have been Carpe Diem! By the time we left the park, with only an hour remaining until it closed, even I briefly contemplated if we should stay, loath to let this wonderful day end. In the midst of our busy, hectic lives, here I found myself, playing full-out with my growing son, a great group of his friends, and all of us having a day that will go down in the memory books for all time. But all great things do come to an end, and I can honestly say that eleven hours passed in the blink of an eye. Exhilarating, fun, wonderful. These are the days that being a mom truly ROCKS. Seize the day? You bet we did. After all, you’re only ten once.